The Washington Redskins are embarking on Year 1 of "The RGIII Era" and lifetime 'Skins fan, Mike Houston, will be here each week to give his thoughts on the 2012 season. Every week, Redskins super-fan Mike Houston will look back, ahead, through and inside the Burgundy and Gold’s performances. Mike was born in Washington D.C. and carried home from the hospital in Redskins pajamas. He was present at FedEx field for the Skins last home playoff win in 1999, which now actually qualifies as a late entry into the New Testament of the Bible. After spending a few years in New York City in enemy territory, Mike has returned to his hometown just in time to enjoy the RGIII Era from the front row. In week one of the 2011 NFL season, the Redskins beat a Giants team that had won 10 games the season before and was three years removed from winning the Super Bowl. In week one of the 2012 season, the Skins beat a Saints team that won 13 games last season and is two seasons removed from winning the Super Bowl. I’m as thrilled as any Redskins fan about Sunday’s game, but I’m attempting to maintain perspective. The Giants team we beat by two touchdowns in last season’s opener went on to win the Super Bowl. We won 5 games. Of course there are major hope-inspiring differences between those two openers, the first being that the 2012 Skins pulled a major upset on the road. After the Saints' Bountygate suspensions being overturned, the Redskins became a 9 point underdog for Sunday’s contest in New Orleans. The Saints had won 19 of 24 home contests in the last three seasons, and the game was a near sellout. Despite all of that, the Redskins became the first visiting team to hang 40 points in the Superdome since 2003. That’s because of hope-inspiring difference number two…. Robert Lee Griffin III is the quarterback of the 2012 Redskins. RGIII had an incredible, but by no means perfect debut. His ability to scramble and elongate plays was what the Skins had hoped for in Jason Campbell and Donovan McNabb. His arm-strength was what we thought we were getting from Patrick Ramsey. His decision making and poise don’t have an apt comparison because the franchise has been without a QB for so long. We started 14 different QBs in the 13 seasons that Peyton Manning was the Colts lone starting signal caller. It’s been rough. So yes, it was just one game, but what a game it was. The receiving corps really stepped up, even when Pierre Garcon left with a foot injury after his long TD. Seven different players caught for at least 20 yards. Alfred Morris carried the load on the ground rushing for two TDs and eating up clock in the second half. Griffin himself ran for 42 yards, but it was the scrambles he didn’t make that impressed more. Twice he had opportunities to scramble for a first down, but he reset his feet and threw for long completions instead of the short gains. The 153-32 rushing yards advantage helped the Skins to control the ball for over 39 minutes to the Saints’ 20. The defense had a large hand in that stat too though. Top rate play from the secondary held Drew Brees to completing less than 50% of his passes. Safeties Gomes and Doughty both intercepted Brees and DB Cedric Griffin forced a fumble deep in Skins territory that may have otherwise led to a Saints score. Lastly the defense held New Orleans to 2 of 11 on third down conversions. 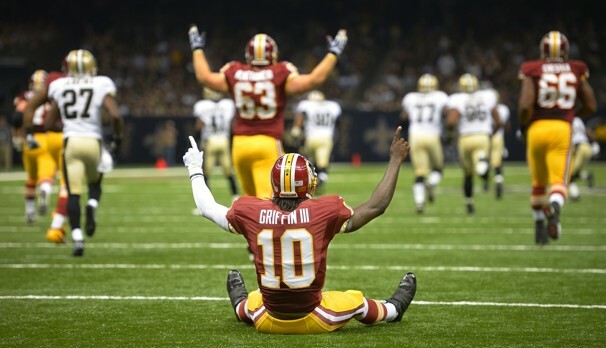 Griffin will deservedly get the headlines this week, but it was an all-around effort for the Skins in New Orleans. The Redskins head to St. Louis next Sunday where they now find themselves as road favorites over the young Rams. Last season’s squad followed their Giants upset with a win over Arizona to move to 2-0. Then they lost 7 of their next 8. History tells me to remain skeptical. The guy at the gas station down the street tells me to put in for Super Bowl tickets. I’ll spend the week gingerly straddling excitement and pragmatism. After all, that’s the Washington way.